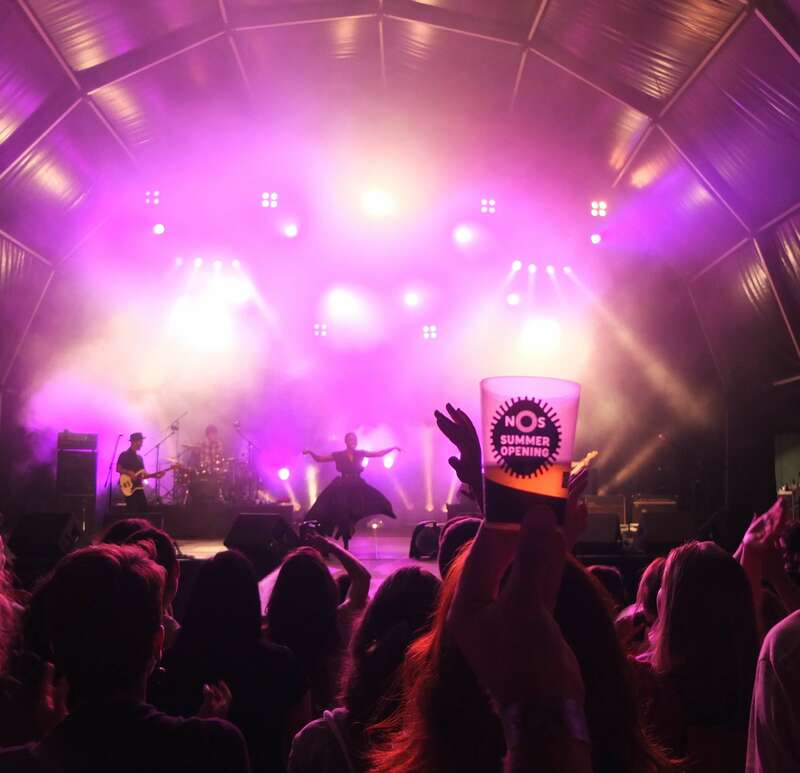 Although Funchal is not the typical cosmopolitan city where you can easily find a music gig happening every night, I have compiled a list of my favourite live music bars and Summer Festivals. Whenever I go travelling I enjoy discovering hidden bars and local bands. It allows me to experience the city as a local while sharing an authentic experience. There’s something about a good live music performance that makes me feel very happy and living in the present. All my darkest memories vanish. One of the highlights of my summer in Madeira was attending the Music Festival Nos Summer Opening in Funchal. Plus I got the chance to meet and listen to the amazing voice of Skye Edwards! Morcheeba songs accompanied me since my days in the University in Lisbon so whenever I listen to those warm psychedelic tunes I feel those good vibes coming back. I love the mellow sounds and the wise lyrics accompanied by the most haunting, smoothest voice ever. It was truly an honour to see them performing live in Madeira. The show had great intimacy. You could feel bodies swinging, a nice small crowd of people and some pretty magic moments on stage. The light’s halo on the stage was impressive, beautiful really. As for Skye, she is the queen of a band full of extremely talented musicians, including her own son, playing the drums. Loved every minute of it. My favourite song? It depends on the mood. I should say I find great comfort in the album ‘Mind how you go’ specially the songs ‘Stop complaining’ and ‘Solitary’. If I’m in the chill out mood I love the old classics like ‘the sea’ or ‘the world looking in’. You can expect a diverse and rich experience. My favourite band of this year’s Festival was ‘Sons of Kemet’ What a great energy and rhythm! Funchal Jazz Festival can’t be missed specially if you’re a jazz lover. Those summer nights in Santa Catarina Park are magical. National and international renowned artists gather in this Festival. Unfortunately this year, I was not in town those days (no pictures, sorry) but everyone was raving about the concert of Mr. Gregory Porter! If you’re looking for a unpretentious, pure music festival that involves no more than good live music by the sea, then ALeste Festival is a great one. Aleste is warmth, is sea, is embrace, is smiles, is music to my ears. This is for me one of the greatest qualities of ALESTE, musicians are handpicked for their dedication to music. The audience feels their enthusiasm, delivery and vibrancy. Lavoisier, Captain Faust, Bonga, The Poppers, Sensible Soccers … It was oh so very good. It is a case to say, where are these vibrant, relaxed and alternative crowd gonna go to the rest of the year? Thank you ALESTE! It’s a date Aleste, next year – the last weekend of May! Also on an everyday basis you can also find a few Live Music Bars or cafes. Hole in One is the name of one of the most popular live music bars in Funchal. Everyday from 9 p.m. onwards there’s live music – You’ll find a relaxed atmosphere either sitting inside or outside the bar. Café do Teatro is right in the heart of the city, in Avenida Arriaga. You can easily find it nearby the beautiful Baltazar Dias Theatre. In this café I attended the concert of my favourite local band – the Akoustic Junkies who played an awesome tribute to Pearl Jam. Copacabana Garden is a cool open air bar located in the Casino, part of the Copacabana club. It is popular for its gin bar surrounded by palm trees. Here you can also find live performances of local and occasionaly international bands. Barreirinha Bar Cafe is one of my favourite bars and it is also so much more that just a bar… Expect Dj sets, movie screenings, a cool crowd of people and of course live music performances by local and foreign musicians. André Santos e Caio Oliveira are playing this Saturday. Check the calendar of events here. Visiting Madeira is not just about walking and sightseeing there are cultural events happening in the Island. From jazz to summer festivals, I encourage you to discover Funchal’s live music. Looking for a place to stay in Funchal on a budget? Check this list. P.S – Feel free to add your comment if you reccomend any other live music venues in Madeira. Thanks!